Sandy Sewell, a radiation protection specialist at the San Onofre nuclear plant, demonstrates common household items that may emit radiation. A Geiger counter swept over a bright red Fiesta dinnerware cup and saucer shows the radiation emitted by the glaze on the ceramic ware, which used to be made with uranium oxide. SCE workers at a Decommissioning Education Fair explain the 20-year plan to decommission the San Onofre nuclear plant. The San Onofre nuclear plant at dusk. The plant is in the process of being decommissioned over the next 20 years. Fairs give the public a chance to learn about nuclear energy and the plant’s 20-year decommissioning plan. The table display at the Laguna Hills Community Center looked harmless enough — a couple of old alarm clocks, a smoke detector and a bright red Fiesta dinnerware cup and saucer. Sandy Sewell swept a Geiger counter over each item. The radiation-detection needle ticked up a little passing over the smoke detector, a little more with the alarm clocks, but then jumped to 40 counts per minute above the cup and saucer. Sewell placed a thin sheet of steel over the dinnerware, and the needle dropped immediately. Her point was to show that radiation is all around us every day, even among commonplace items found in many homes. “That was cool,” said Loretta Herrin, unconsciously taking a step back from the Geiger counter. Sewell is a Southern California Edison radiation protection specialist at the San Onofre nuclear plant. Her “Radiation and You” demonstration was part of a Decommissioning Education Fair held this summer. 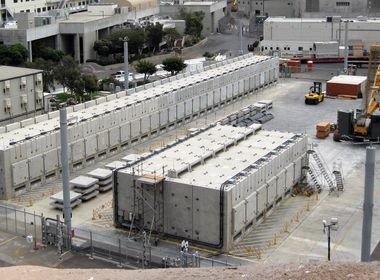 “We are holding these fairs as part of our commitment to include the community and our diverse stakeholders in our decommissioning process,” said Tom Palmisano, SCE vice president of Decommissioning and chief nuclear officer. Sewell said the Fiesta dinnerware, which used to be made with radioactive uranium oxide in the glaze, and the clocks, which had glow-at-night radium or tritium dials, emit radiation. Herrin, a Lake Forest resident, said she went to the fair to learn more about the San Onofre nuclear plant and its operations. The radiation demonstration was an unexpected bonus. “I didn’t know anything about any of this,” she said. Many of the other 60 adults and children attending had a similar reaction. One of the biggest surprises was the artificial reef exhibit. 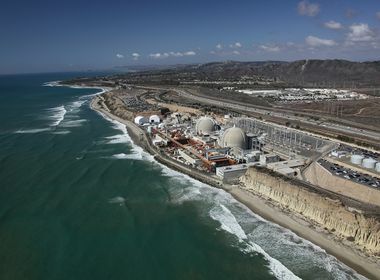 SCE completed the reef off the coast of San Clemente in 2008 to offset the impact of the nuclear power plant’s ocean water cooling system on a nearby kelp bed. The 176-acre reef has since become home to a thriving kelp forest. The display included a hands-on exhibit of live kelp, sea urchins and other marine life for visitors to learn more about the reef and its ecosystem. Other exhibits at the fair included emergency preparedness, plant security and a display of how the spent fuel from San Onofre’s nuclear reactors will be safely stored on site until the federal government approves a permanent place to house it. Herrin, the Lake Forest resident, said she learned a lot at the fair, but wants to know more. Her next stop? Attending one of the walking tours San Onofre hosts at the plant every month. 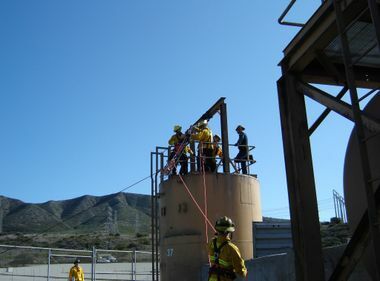 The next community Decommissioning Education Fair will be Thursday from 4:30-6:30 p.m. at the Laguna Beach Community & Susi Q Center, 380 Third Street in Laguna Beach.